﻿ Division Dragons - Online Inetractive Divison Game for 3rd grade. Help the witch guard her castle, by shooting down the dragons. Each dragon holds a number that might be the answer to the division problem that appears below. 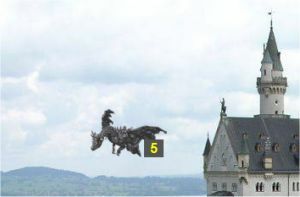 Click and shoot the dragon that holds the correct number. Don't let them catch the witch! Please note! The size of the current browser window might be too small to play this game. Try to maximize the window, or press the F11 key to go full-screen.